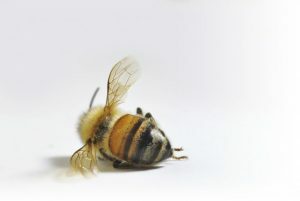 The country banned all 5 of the neonicotinoid pesticides that researchers are blaming for collapsing bee populations. The move follows the European Union’s ban of the three worst offenders — clothianidin, imidacloprid and thiamethoxam — in crop fields starting last month. France has banned these three along with thiacloprid and acetamiprid, not only outdoors but in greenhouses too. Studies have shown that neonicotinoids cut bees’ sperm count and scramble their memory and homing skills. The latest research suggests bees can develop a dangerous addiction to the insecticides, much like smokers for nicotine. The ban is celebrated by beekeepers and environmentalists, but cereal and sugar beet farmers warn it could leave them defenseless in protecting their crops against harmful insects, The Telegraph reports. Introduced in the mid-1990s, synthetic neonicotinoids share the chemical structure of nicotine and attack the central nervous system of insects. The United Nations warned last year that 40 percent of pollinators – particularly bees and butterflies – risk global extinction.